connected system of orders and inventory. with every department of the organization. from anywhere and at any time. faltering on the inventory management. Managing a business and making beneficial decisions for the business requires real-time and updated knowledge of all the operations running in your business. Keeping a track of every administrative function being carried out in your organisation can be an extremely tedious task, especially if all the operations are tracked using separate business management software. getERPnow, an ERP software asserts itself as a one-stop solution for all our business management needs by providing integrated software for all business administrative functions. Imagine having to check single software to get a real-time view of all your business operations and manage your inventory, warehouse, order, and accounting without maintaining individual track records. As a business which is small, growing or midsize, getERPnow can benefit you by increasing your efficiency in managing current operations by providing a common platform to employees across various departments in the form of a central ERP system. This, in turn, leaves scope for you to grow exponentially in productivity and customer service. As wholesalers, distributors and retailers, you are in dire need of a stout and dependable business management solution that takes the load of tracking the flow of inventories moving in and out of your warehouse. With getERPnow, gift yourself some peace of mind and more productive time. SMB clients who have installed getERPnow business management software in their organization are enjoying the benefits of connected workflows, centralized data, streamlined processes and easy monitoring of their business functions minus the time constraints. 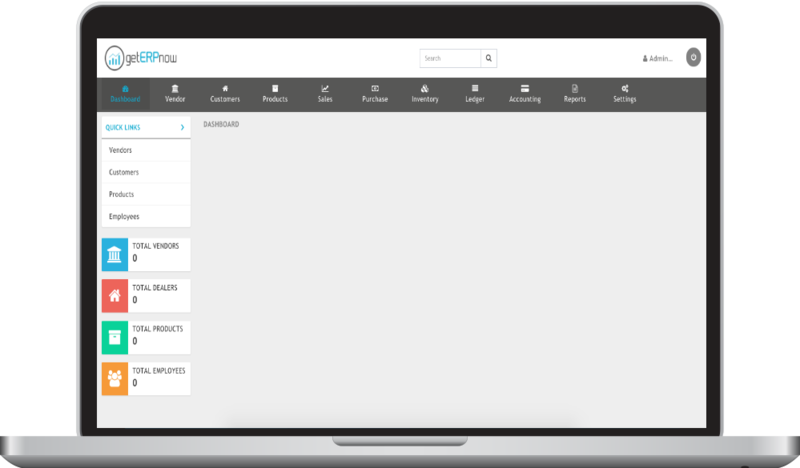 Be free of the straining task of tracking orders through its multiple gateways. getERPnow connects every nook of your business decreasing the risks of derailed invoice, vendor agreement or a hampered customer relationship. Automate the tracking of orders from the point of purchase till the payment is recorded and manage sales, vendors, inventory and purchase orders using the reliable data of a fully connected ERP system. Integrate your inventory tracking, warehouse and manufacturing functions with a live central database that can be easily accessed to gain real-time information about the flow of your inventory. getERPnow works in conjunction with your existing workflows and processes. Install a compendious accounting software that merge General Ledger (GL), Accounts Receivable (AR), Accounts Payable (AP) and billing. Audit the value of every penny present in your business with a reliable and adaptable accounting system which branches out to every department of your business. Multi warehouse management, pick pack and ship, location control, returns management Manage multiple warehouses with a common tracking system informing you of all the picking, packing and shipping taking place in them. Also, enjoy easy location control and returns management with getERPnow.